A South Korean report written by an international team of investigators accuses North Korea of firing a torpedo that sank the Cheonan warship in March, killing 46 sailors. 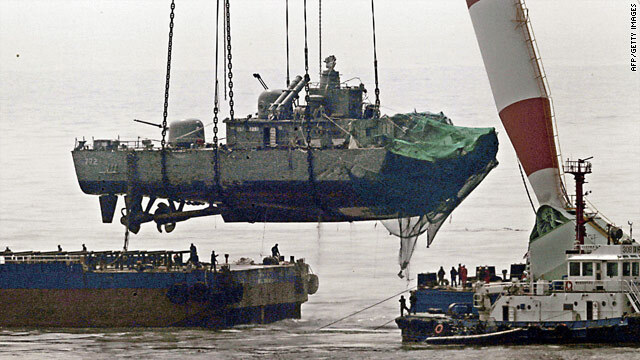 (CNN) -- South Korea's defense ministry will show wreckage of a sunken ship to a group of Twitter users in an effort to dispel doubts among young skeptics about its investigation blaming North Korea for attacking the vessel, state media said Monday. Twenty users of the microblogging site will have a chance to review the evidence Friday after applying through the defense ministry's Twitter page, the Yonhap news agency reported. A group of college reporters and defense bloggers will also be invited to the presentation, which is part of a push to win over younger skeptics, Yonhap said. North Korea has denied any involvement in the sinking and criticized the report's accuracy, claiming people who disagreed with the investigators' assertions were expelled from the investigation team, the state-run Korean Central News Agency reported. Questions about the report have also surfaced online, Yonhap said. Police are investigating online rumors about the ship's sinking, according to Yonhap, and have said they will reprimand those responsible for spreading unfounded allegations. On Friday, Twitter users will be briefed about the investigation's results and allowed to take photographs of the wreckage, Yonhap reported. The ship's sinking and ensuing report have escalated tensions throughout the region. After the report's release, South Korean President Lee Myung-bak said that South Korea was suspending trade with North Korea, closing its waters to the North's ships and adopting a newly aggressive military posture toward its neighbor. North Korea reacted to a South Korean anti-submarine exercise Thursday by saying it would meet "confrontation with confrontation" and war with "all-out war," according to North Korean state-run media. Lee has said South Korea plans to bring the issue before the United Nations Security Council.